Misalignment is not an uncommon problem. Most people have some degree of spacing or alignment issues in their mouth. If your smile is not all you would like it to be, consider correcting concerns such as overlapping teeth, gaps, or minor malocclusion with Invisalign. Invisalign is a method of straightening teeth that is commonly referred to as an aligner system. In place of metal brackets and wires are clear plastic aligners that have been custom made to achieve specific movements in upper and lower arches. Many teens and adults are excellent candidates for Invisalign treatment. This method of care is suitable for individuals whose teeth are mildly to moderately crooked, including teeth that are turned. Invisalign can close gaps and correct mild overlapping, as well. Patients with a minor overbite, crossbite, or underbite may achieve a straighter, healthier smile without needing to wear braces. Invisalign may not be suited to patients with severe malocclusion who need early or complex intervention. The best way to know if Invisalign is right for you is to consult with an experienced provider. We are happy to schedule a consultation for you in our NYC office. Invisalign works on the same principle as standard orthodontic treatment. Using consistent, gentle pressure, the aligners that are custom-made in the Invisalign lab force teeth into a new position. 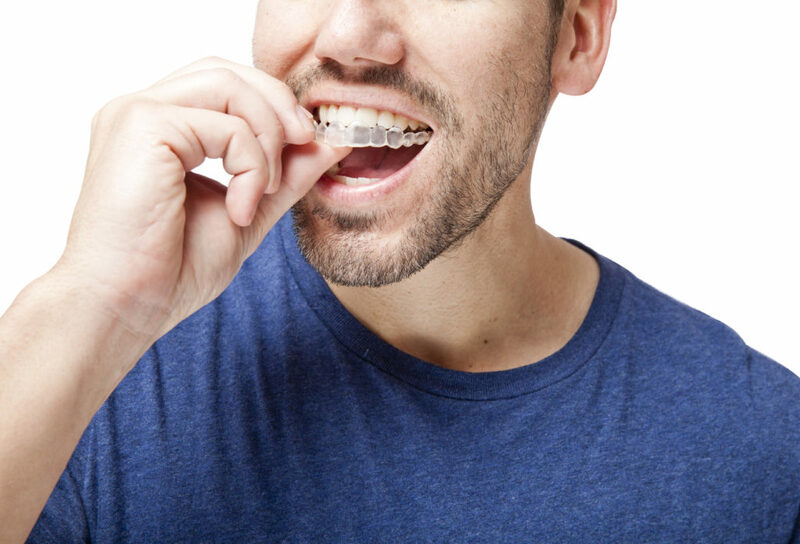 Each set of aligners, or single aligner if only one arch is being treated, is worn for two weeks. At the end of each two-week period, teeth will be up to .25 mm straighter than they were when the aligner was first inserted. Every new aligner will progress the movement of teeth by fitting precisely over the arch as determined by the prescribed treatment plan. There is a very clear difference between Invisalign and traditional braces: the clear plastic aligners that straighten teeth. It is possible to use aligners to correct many of the minor alignment issues that were once only treatable with braces, making the entire process more discreet and comfortable. Removable aligners do not limit what one may eat during their course of treatment. Removable aligners support ongoing oral care and decrease the risk of tooth decay during treatment. Clear plastic aligners are the most discreet fixtures to straighten teeth. Aligners mold to the teeth and do not protrude into the soft tissue of the mouth, eliminating the risk of sores and cuts. Invisalign treatment begins with a thorough consultation and examination of the arches and position of teeth. Then, when the decision has been made to move forward with aligner treatment, a digital scan is performed to obtain accurate 3-D images of teeth and arches. These images are used to develop a customized treatment plan that includes a very precise map of when and how teeth will move, right down to which individual teeth may be moved at what point during treatment. Using the map created by the dentist, developers in the Invisalign lab create customized aligners out of BPA-free plastic. The number of aligners that are made coincide with the degree of movement that is desired. A lesser degree of misalignment typically requires fewer aligners and a shorter treatment period than more complex problems, such as an overbite or overbite. Throughout the active treatment phase, patients wear every set of aligners for two weeks. Checkups are scheduled approximately every six weeks. These appointments usually take only about thirty-minutes, allowing us to observe teeth and answer any questions that may have arisen. This process of two-week wear and progress checks continues until the final set of aligners has been worn. During the final visit, impressions are taken to obtain an up-to-date model of the mouth. This model is used to fabricate a retainer that will be worn for several months to prevent shifting. Because Invisalign treatment is so convenient and comfortable, there is no major transition after treatment has ended. Patients will be instructed to wear their retainer at all times for several months. After some time, daily wear may decrease to night-time use only. Aligners should be rinsed with lukewarm or cool water before they are inserted into the mouth. When they are removed for meals, they should be stored in a safe container that will not accidentally be thrown away. Before inserting aligners after meals, it is beneficial to swish water around in the mouth and also run aligners under cool water. Aligners do not need to be brushed or soaked. How long will I need Invisalign? Invisalign treatment may last from a few months to two years depending on the extent of misalignment or malocclusion a person has. Your dentist will estimate the length of your treatment plan after your initial consultation and exam. If you would like to learn more about Invisalign, call 212.758.9690 to schedule a consultation at Prosthodontics of New York. Our practice serves NYC, Manhattan, and surrounding areas.